Coffee is one of the most powerful consumable products in the world. Following only oil, coffee is the most valuable commodity traded legally around the world. With more than 2 billion cups of coffee consumed daily worldwide, coffee is a ritual and a necessary part of many people’s days. Modern roasted coffee can be traced to Arabia in the 13th century. Praised for its ability to stimulate drinkers, coffee is said to have been exclusive to Arabia until the 1600s when the Dutch and French began spreading the beautiful product to other nations. Since that time, coffee roasts have only grown in popularity, leading to many different types and flavors. The chemical process of roasting coffee involves a combination of aromatics, acids and other flavors to create the perfect balance of flavor, body, acidity and aftertaste that makes coffee delicious. Top coffee companies consider roasting more than a chemical process, however. To coffee purists, it is nothing less than an art form. Coffee roasting is a multi-step process. Coffee beans begin at a green color, and they must be dried until they turn yellow and begin to smell like toast or popcorn. This is an endothermic process that is usually completed by heating the beans to around 400 degrees Fahrenheit inside a roaster. After 8 to 15 minutes at this temperature, the beans lose their moisture, and they make an audible “popping” sound much like popcorn. After they pop, the coffee beans continue to be heated, but they are now at their ideal roasting temperature. The roaster’s drum will continually rotated to keep the beans heating evenly throughout this process. With constant checking, the beans will continue to darken in color, beginning at a light roast and continuing into a darker roast. This second stage of the roasting process is called pyrolysis. In it, the coffee beans begin to change their chemical make up as the starches become sugar, and the proteins are broken down, leading to a second “pop.” This chemical change is the last step before the beans begin to release caffeol, better known as coffee oil. This is what is enjoyed when coffee is brewed. Coffee roasting is based on simple science and the chemical properties of the beans, but there is an art to it as well. When the beans are exposed to too much heat or are roasted too dark and long, the caffeol will be burnt. On the other hand, under-roasting will reduce the amount of caffeol produced. This leaves the roasting process to a good deal of judgment by the coffee roaster. 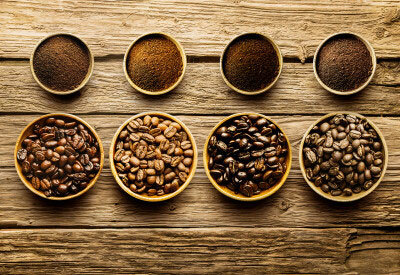 As coffee beans are roasted on a continuous basis, there is a wide range of different types of roasts. Beans that are removed from the roaster the most quickly will be the lightest roasts, while beans that spend more time roasting at a higher temperature will be the darkest. Roast level preferences are entirely subjective. Some people are drawn to lighter roasts, while others will only drink espresso-level coffee. As a general rule, preferences can often be determined by where coffee consumers live. For example, Europeans tend to enjoy darker roasts, like West Coast Americans, but East Coast Americans prefer light roasts. In addition, most coffee companies and manufacturers set their own roast names and descriptions, meaning that there is little standardization in the coffee industry. This can make it more confusing to find the perfect roast level.